This perennial stone cress flourishes on our Limestone Rock Garden. 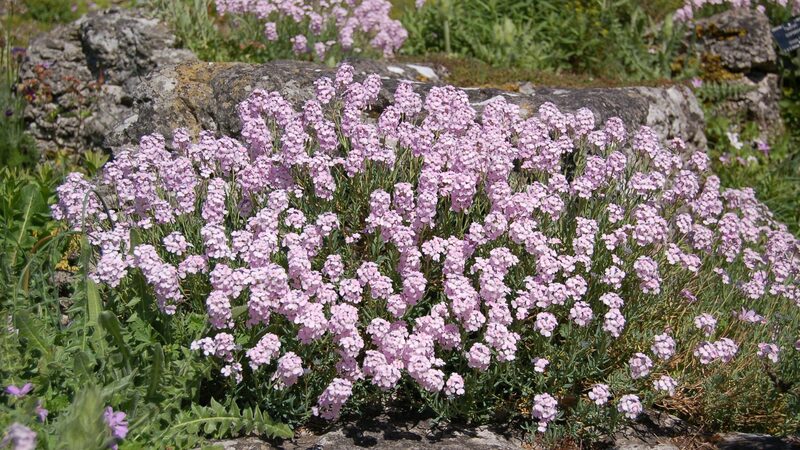 Originating in eastern Turkey, northern Iran and the Caucasus, the pale pink flowers of Aethionema grandiflorum are typical in form of the cabbage family (Brassicaceae), to which it belongs, having four petals which form a cross-shaped flower. The genus Aethionema comprises approximately 40 species of evergreen or semi-evergreen sub-shrubs, and perennials and annuals. In the wild A. grandiflorum occurs in sunny limestone habitats, and it grows well with us in this open, well-drained position.